Having hit level 100 in World of Warcraft's Warlords of Draenor expansion pack earlier this week, I spent early Thursday morning camping a rare spawn for four hours. I accidentally captured most of it on video. Don't worry, I sped it up. Camping a rare spawn. There's something I've never done in World of Warcraft before. Back in my EverQuest days sure, but I cannot recall an instance over the past ten years where I've sat and waited in one spot for four hours at a time, waiting for a single creature to arrive. I was fixing to head to bed late Wednesday night, following an evening spent treasure hunting in the Nagrand zone, searching for garrison resources to upgrade my stronghold to level three. As I was about to call it a night, someone in general chat mentioned a raid group forming for Nakk the Thunderer. I couldn't resist. Nakk is one of several rare elite spawns in Warlords of Draenor that gives everyone who tags it — even a single spell will do — a mount drop. His spawn times are kind of ridiculous — the general consensus is 22-27 hours — but everyone who participates gets a Bloodhoof Bull mount. So Nakk is Nagrand's Oprah. So I formed up with the group around 2:30 AM my time, and we waited. And waited. And waited. Around 3:20 AM or so I accidentally hit the key to start recording video. What follows is two hours and change of camping, compressed into six minutes, with narration. I was exhausted. At several points during the camp I fell asleep. At one point, as seen in the last few minutes of the video, I fell asleep with my finger on the mouse button and died. Eventually we all got our Bloodhoof Bull. Naxx spawned about half a zone away, we all rushed over and managed to tag him before the battle was over. Completely drained but incredibly happy, my new mount and I waddled off into the sunset. 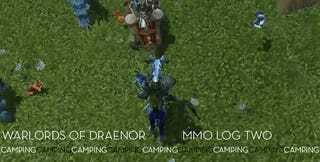 I dedicate the second Warlords of Draenor MMO log leading up to our final review of the expansion to these four hours. To this fellowship of fifty or so Horde and Alliance characters, banding together to do something relatively stupid for an extended period of time. I still don't have a guild on Moon Guard ( I hear Collars and Cuffs is nice), but this random smattering of people brought me back to the days when I was heavily invested in my own long-forgotten guild. I was worried I'd hit level 100 and have nothing to do, but as you can see my plans go far beyond the level cap. At this same point in the Mists of Pandaria expansion I was desperately trying to force myself to play. Now I can't stop. That's a very good sign. If all goes well, look for our full Warlords of Draenor review next week, unless I feel like prolonging the magic with one more MMO log. We shall see.